The 7th Annual Reno Pet Show is happening on 19-20 Mar 2016 at Reno Sparks Convention Center. It is one part of 4 different shows. More info HERE. 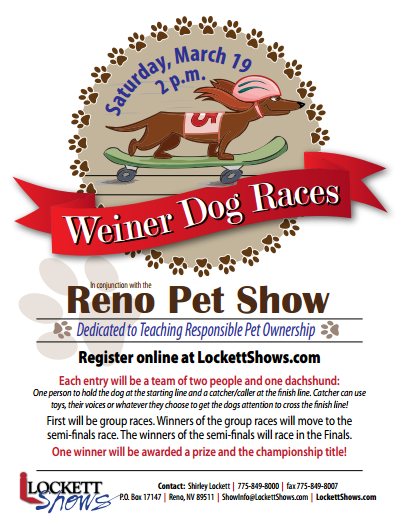 The Second Annual Weiner Dog Races will be held starting at 2 p.m. on Saturday. Please pre-register for both the races and parade! please fill out the registration form HERE. (One admission price for all four shows! 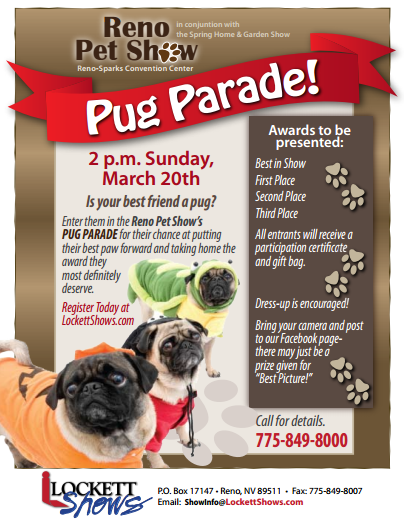 This entry was posted in ArrowCreek 411, ArrowCreek411, Reno Pets and tagged ArrowCreek 411, ArrowCreek411, Reno Pet Parade, Reno Pug Parade, Reno Weiner Dog Races. Bookmark the permalink.